Air travel gets you to your destination faster, but there is something really special about a long trip by car with the entire family. 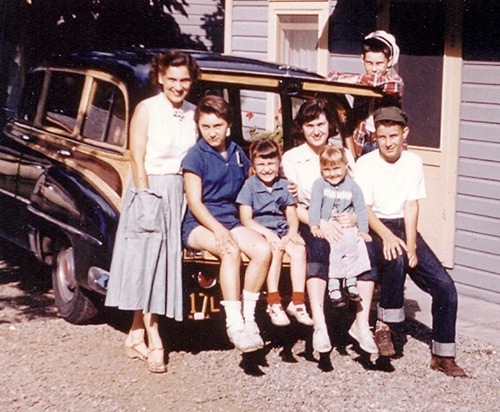 Happy Hollisters’ author Andrew Svenson traveled frequently with his family to the Pymatuning Reservoir, north of Pittsburgh, and those trips inspired many of the stories in The Happy Hollisters series. 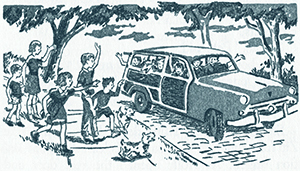 The trip from the Svenson home in New Jersey was about 400 miles. In those days (before interstate highways), the trip probably took 8-10 hours. Yikes! No wonder they allotted two days for the journey and stayed in quaint tourist camps along the way. Frequent stops for fuel and food (no McDonald’s every few miles back then) gave them the chance to get out and stretch their legs, and the small towns they visited provided fresh inspiration for adventures and interesting characters. 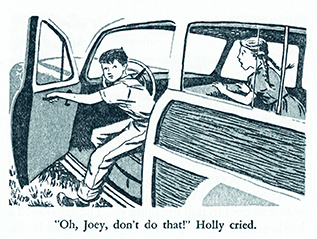 The fictional Hollister family has their first run-in with bully Joey Brill when they stop overnight at a tourist camp on their move to Shoreham, and Joey tries to make off with the Hollisters’ car. In later volumes, airplane travel became more accessible for families and many volumes of The Happy Hollisters involved cross-country or international flights. Flying with a large family was never inexpensive, but it sure made for some swell stories! It’s pretty safe to say that no matter where the Svensons (or Happy Hollisters) went, or how they got there, mystery and adventure were always on the itinerary!